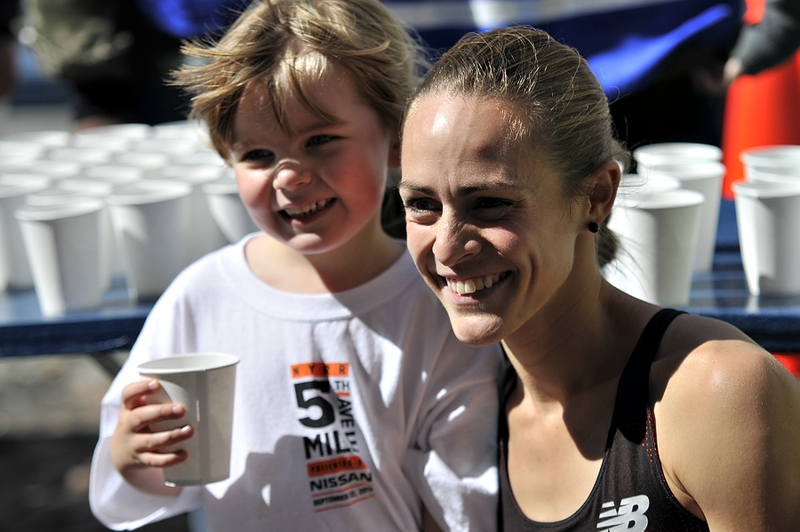 After a commanding win at the 5th Avenue Mile in NYC yesterday, Jenny Simpson hinted at a return to cross-country. 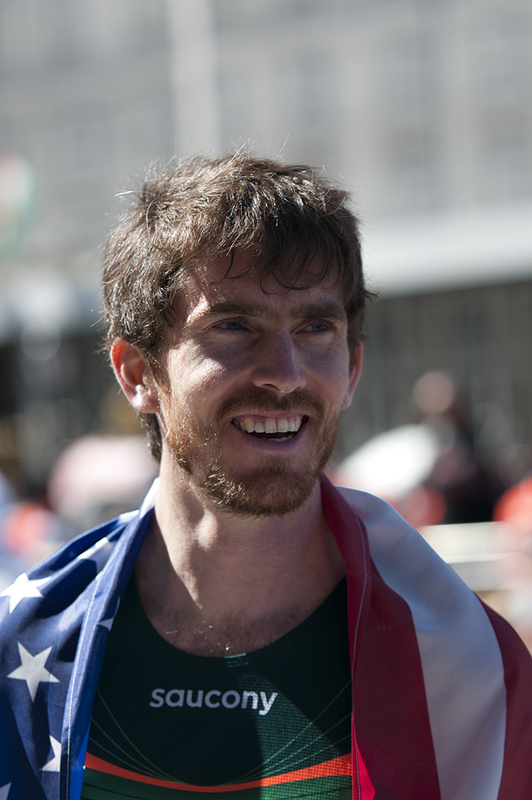 The U.S. Cross Country Nationals will be held in Boulder in Feb. 15, 2014. “That would be a hard thing for me to pass up. It would be really hard for me not to be there,” she said (full interview above). Jenny noted that she’d be dedicating the next two weeks of not running to helping clean up flood-damaged running trails in Boulder. 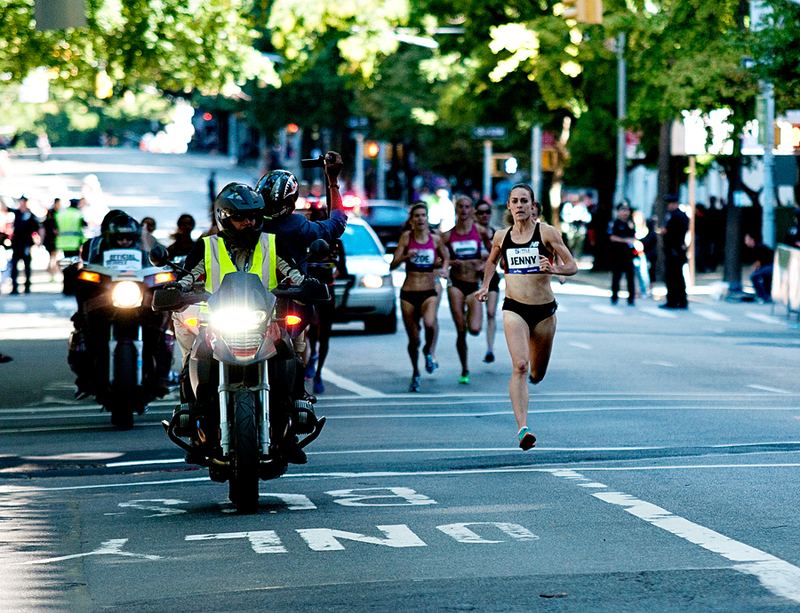 The race itself was dramatic for about 400 meters. 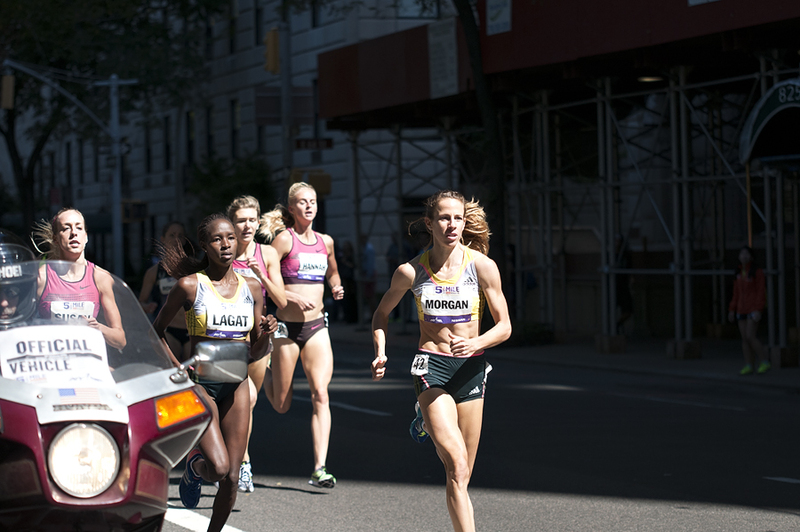 During the first, downhill quarter, Shannon Rowbury, in the Al Sal silver and black Nike Oregon Project singlet, took position on Simpson’s left shoulder. If there was going to be a race, it would likely be between these two, who combined had won three of the last four times at this event (last year’s champ Brenda Martinez, coming off a break in training, was not entered). During the second quarter, the one uphill segment, Jenny separated from Rowbury and the rest of the pack and steadily increased the gap on the downhill second half mile. By race end Simpson (4:19.3) had over four seconds on a fast finishing runner-up Morgan Uceny (4:23.4). Back in April, Simpson so thoroughly dominated the Drake Relays 1500 invitational, Sam Grotewold of nyrr tweeted: “If @trackjenny was a rock star, she just dropped the mic and walked offstage.” That pretty much sums up her entire season. Unlike the women’s race, there was no clear-cut favorite for the men, but New Zealand’s Nick Willis, returning with a vengeance from an early season calf injury, showed the form that made him the 2008 Olympic silver medalist. With about 150 meters to go and after Willis had opened a gap, he looked back over his shoulder, not out of fear as one might in a longer race but rather, it seems, to gauge whether he had time to start celebrating. He then raised his arms to get the crowd involved while still needing to cover 100 meters to the finish, with notable kickers behind him. This was no Steve Ovett move — Willis would hang on to win the race. 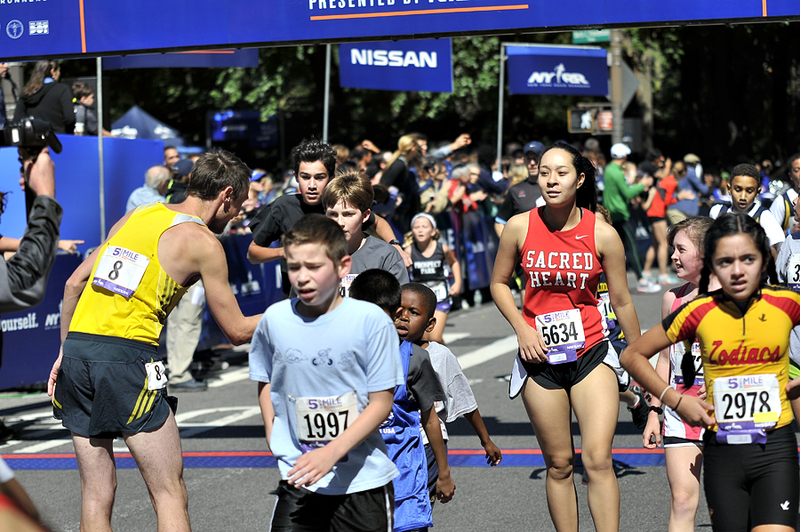 It brought to mind Ryan Hall rallying he crowd en route to the 2008 Olympic Trials victory in Central Park well before the finish. 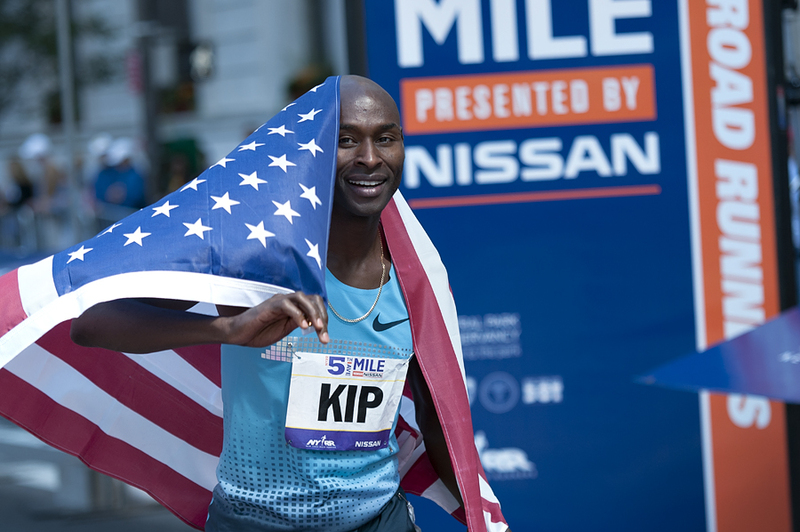 With a big grin the Kiwi (3:52.1) crossed the tape before Bernard Lagat (3:52.9), Garrett Heath (3:53.0) and the other pros. Victory secured, Willis hung around at the finish line and offered high-fives to the 8-14 year old kids who were finishing the last race of the day. All photos by Sue Pearsall. 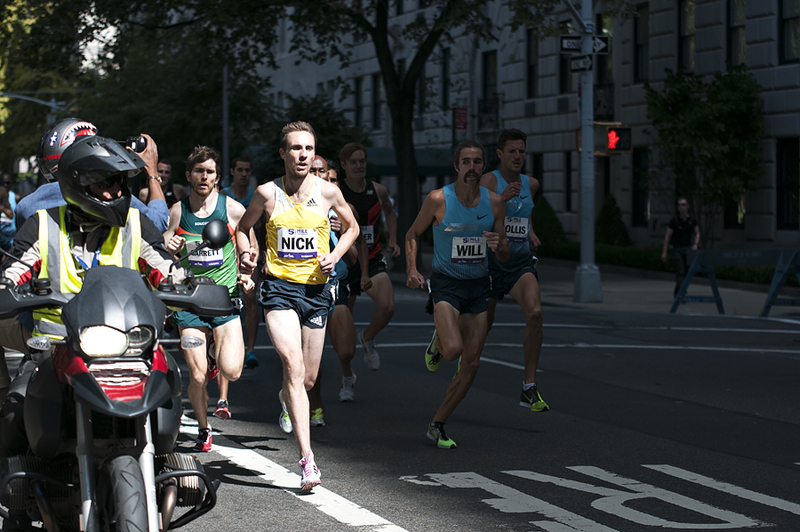 Check out spear.smugmug.com for more photos of the 5th Avenue Mile.